It is cold, so cold. I usually have a hard time getting through the freezing cold April here in PEI, but this year the cold-rainy-windy-horribleness has crept into my usually lovely May. What’s the best way to deal with this? Knitting! 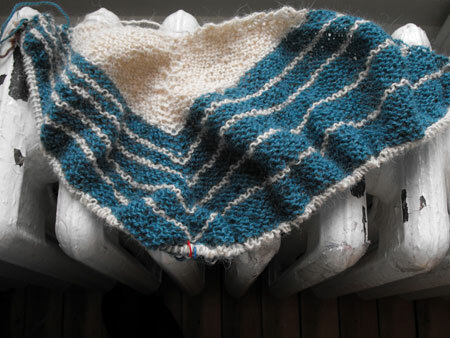 I’ve started my Stripe Study Shawl! It is wonderful to knit, and I can’t wait for it to be done (I could really use it right now). I bought some lovely fine alpaca yarn in beige and teal at the Farmer’s Market. It is so soft and fluffy. I’m going to keep on happily knitting and pretend I don’t notice what it looks like outside.